After I read about the Sonoff S26, and that it is compatible with Google home, I decided to order a couple of them. In addition to using them as a remote-controlled power switch, I'm interested in resuming my experimentation with the esp8266 that the devices use. The physical construction is OK, though, as can be seen from the photo above, the logo is upside-down. I know there is some debate over which way a Nema 5-15R outlet should be oriented, with the ground down being more common in residential, and ground up perhaps being more common in commercial. The readability of the logo does not effect functionality, so that's not a big deal. 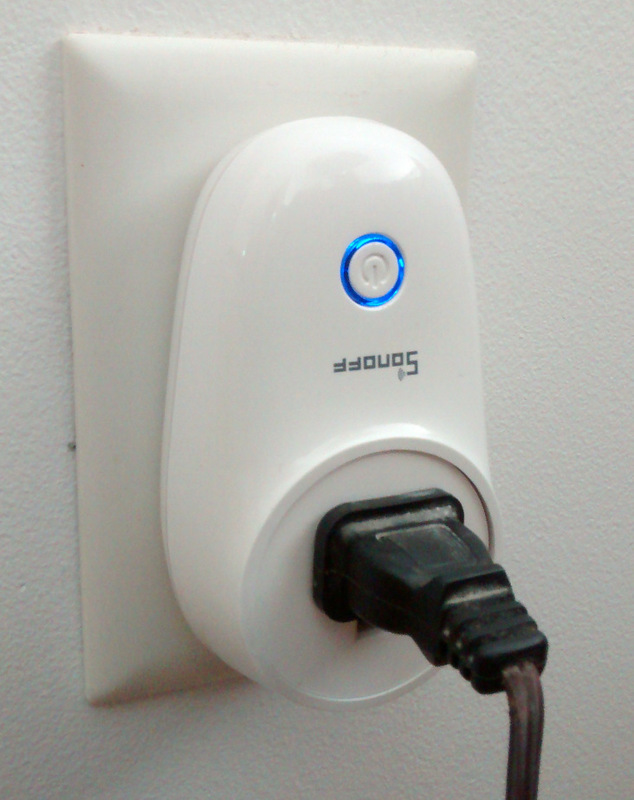 What does effect functionality is the size of the S26, which can partially block the ability to use both outlets. Cnx-software has a teardown of the S26, so I won't bother repeating any of the details. The unit I received was virtually indistinguishable from the one depicted in the teardown. The one slight difference I noticed was the esp8266 module in my S26 has a hot air solder leveling finish (HASL) instead of electroless nickel immersion gold (ENIG). The eWeLink app is my biggest gripe about the s26. In order to install the app, it requires numerous permissions that have nothing to do with controlling the s26. Things like access to device location and contacts are an invasion of privacy, and a liability for itead if someone hacks their database and gets access to all the personal information from eWeLink users. The only permission the app should need is local wifi network access. After holding my nose over the permission requirements, it didn't get much better once the app was installed. It does not work in landscape mode, and once you create an account, it doesn't remember the email when it gets you to log in to the newly created account. The menus and some of the fonts are rather small, especially on an older phone with a 4" screen. I also tested out the firmware update function in the app. My s26 came with v1.6 firmware, which I updated to v1.8. The new firmware version is supposed to support direct device control over the LAN without an active internet connection. After the upgrade the device info indicated it was running the new firmware, but direct LAN control did not work. Without an active internet connection, when I tried turning the s26 on, I got an "operation failed" message. My last gripe is about the cumbersome process of setting up devices to work with Google home devices. Having to first setup an account for the Sonoff devices, then having to link that account with the google home account is cumbersome and error-prone. The google home app should be able to scan for devices the same way it can scan the local network and find a Chromecast. And for people that are using Sonoff devices without Google home or Amazon, the app should allow users to control devices locally without having to set up any account.